Police are appealing for information after a robbery in Banstead yesterday morning. A man was robbed on the bridal path parallel to the train station off Banstead Road shortly before 7.30am. The victim was threatened by two individuals believed to be carrying a gun and was forced into giving up his phone, wallet and bank card pin number. 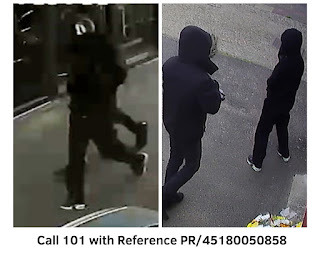 Detectives want to speak two a man and woman caught on CCTV, who were wearing black hoodies and trousers.